We all sat around the computer and prayed and looked together at pictures of kids, and we decided on him. We are very excited! Noah (our eight year old) got teary several times as the impact of what we are doing was hitting him, that our 32 bucks a month will make such a HUGE impact for Enock and his family, so much more than here. Noah wants to send toys and books (which apparently we cannot officially do, but the thought is awesome), and Abbie (our four year old) wants to color pictures to send. We will all be praying for Enock and his family daily, and are looking forward to getting the packet of info from Compassion so we can begin to connect with him! 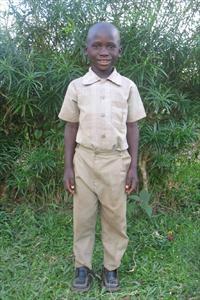 Anyway, when I do start working, we want to sponsor another child, a girl about Abbie’s age. We are going to be buying grocieries for the church food pantry, and bring the kids there to serve. We really want to start living differently to do what we can to live out the gospel more and more. Lent is about conviction, about repentance, about transformation. This is where God is getting to us. And if we can make a temporal and eternal difference in the life of a boy and his family in Uganda, I’m pretty thrilled with that. At the risk of sounding like a commercial, I encourage any and all of you reading this to consider sponsoring a child through Compassion, or at least to do something actively for the poor. Don’t do it because you feel like you should, or because some guy in a blog is suggesting it. Think and pray about, search the scriptures, do what God tells you to do, and honor God with your wealth. God has more to say in scripture about caring for the poor than most of us like to think about. If every family in the Western church did something like this, the results might just be radical! And I think that might make God pretty happy. More info on Compassion here. More info on Uganda and the bloggers here. Sponsor a child here. Live the gospel everywhere.